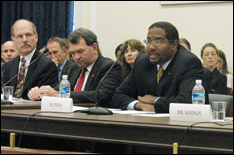 Clark School Dean Darryll Pines testified before the Committee on Science and Technology, Subcommittee on Research and Science Education, of the U.S. House of Representatives last week. His speech advocated the inclusion of engineering concepts within K-12 education, both to inspire students with engineering’s ability to improve the world and to prepare students for rigorous college-level programs such as the Clark School's. "By engaging students at the proper level at the proper time, schools can ensure that students are neither intimidated by the difficulties of engineering, nor deluded that engineering is essentially dreaming up ideas without the foundation of creating, analyzing, testing, and refining a solution using math and science," Dean Pines said during his testimony. Pines highlighted several programs offered by the Clark School of Engineering. For example, the school's Center for Minorities in Science and Engineering, and the school's Women in Engineering program, offer summer and academic year programs that introduce primary and secondary school students to the field. He also recommended taking Clark School innovations like the Keystone Academy of Distinguished Professors nationwide, to retain more engineering students in their college programs and improve overall engineering graduation rates. His full testimony is available online.